I learned this figure from the same Eskimo, Chief Zaroff, who showed me the "Mouth." The native name is Grut = the Breastbone and Ribs. 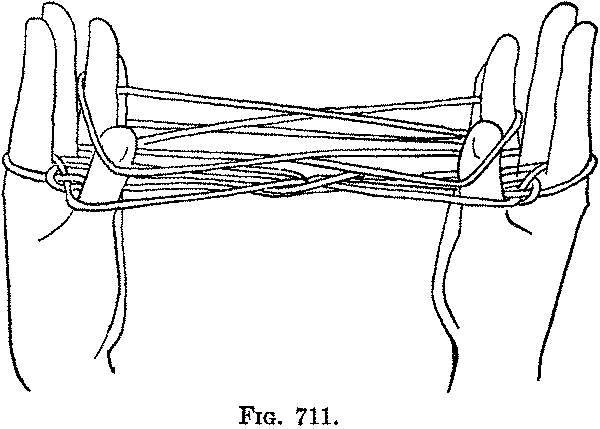 First: Lace the string between the fingers of each hand, so that it passes behind the thumb, the middle finger and the little finger and across the palmar surface of the index finger and of the ring finger. 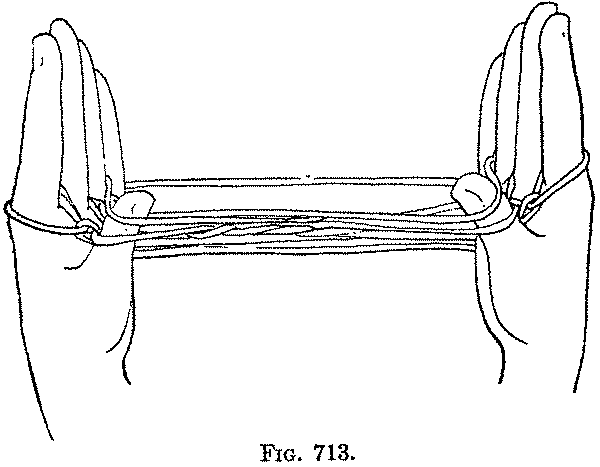 The near thumb string and the far little finger string pass straight from hand to hand (Fig. 703). 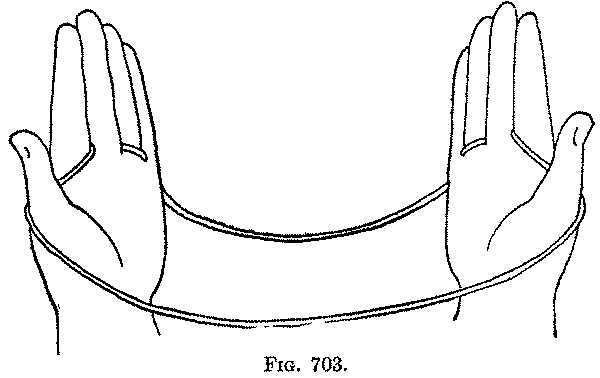 Second: With the right index take up, from below, the string on the palmar surface of the left index (Fig. 704) and separate the hands. 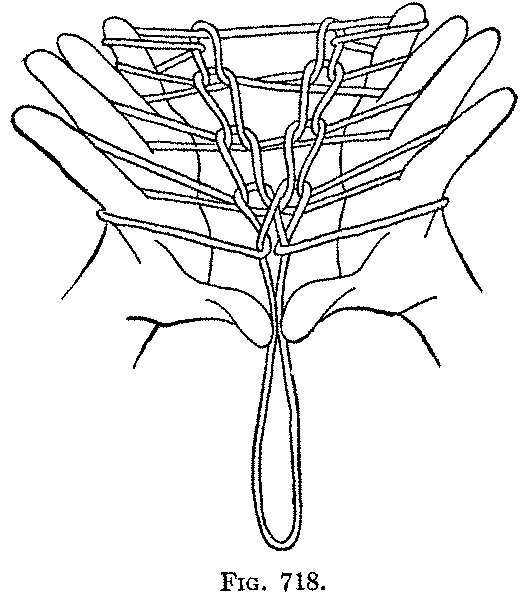 With the left index take up from below, between the strings of the right index loop, the string on the palmar surface of the right index and separate the hands. 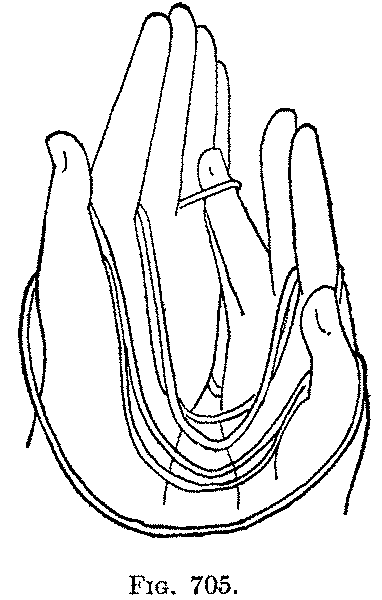 Third: With the right ring finger take up, from below, the string on the palmar surface of the left ring finger (Fig. 705) and separate the hands. With the left ring finger take up, from below, between the strings of the right ring finger loop, the string on the palmar surface of the right ring finger and separate the hands. There is now a loop on every finger of each hand (Fig. 706). Fourth: Put each thumb from below into the index loop, and separate the thumb from the index (Fig. 707). 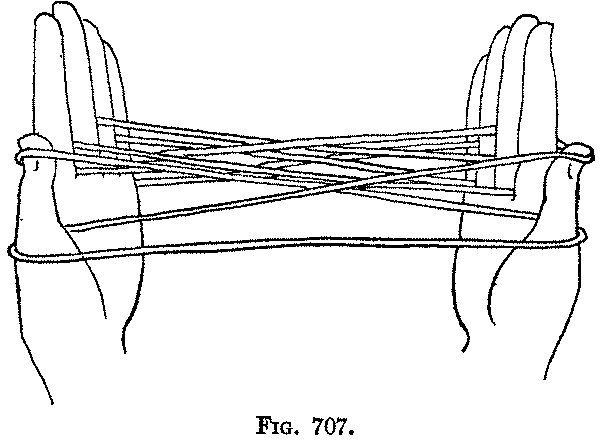 With the teeth draw the original thumb loop, of each hand in turn, up over the loop passing around both thumb and index, and, slipping it entirely off the thumb, let it drop on the palmar side (Fig. 708). 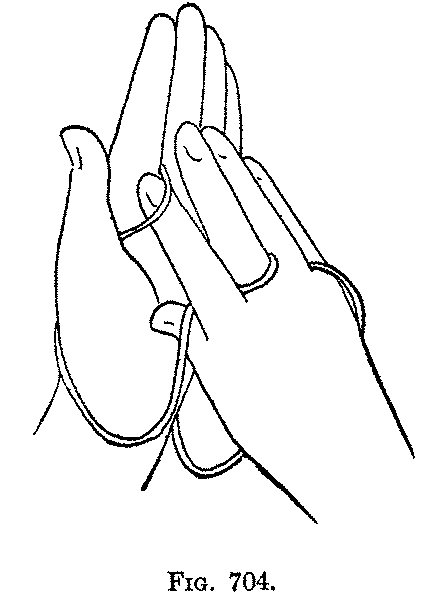 Fifth: Pass each thumb away from you over the far thumb string and both strings of the index loop, and take up from below, on the back of the thumb, the near middle finger string and return the thumb to its position (Fig. 709). 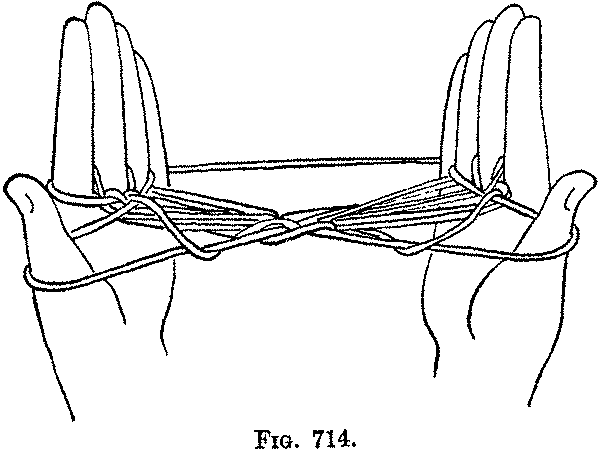 With the teeth draw the lower thumb loop, of each hand in turn, up over the loop just taken on the thumb, and, slipping it off the thumb, drop it on the palmar side (Fig. 710). 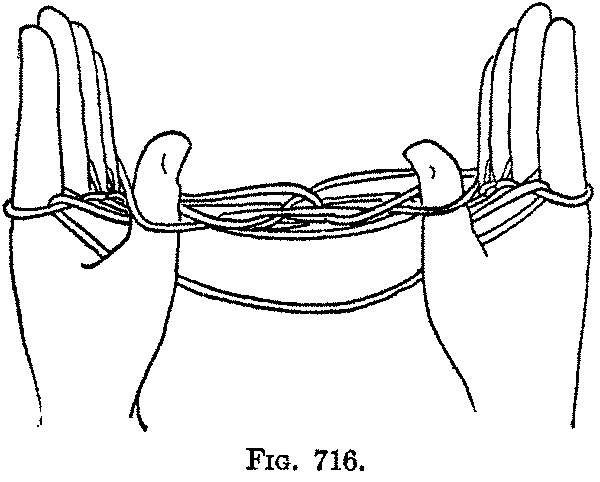 Sixth: Pass each thumb away from you over the thumb, index and middle finger loops, and take up from below on the back of the thumb the near ring finger string, and return the thumb to its position (Fig. 711). With the teeth draw the lower thumb loop, of each hand in turn, up over the upper thumb loop (the loop you have just taken on the thumb), and, slipping it off the thumb, drop it on the palmar side (Fig. 712). 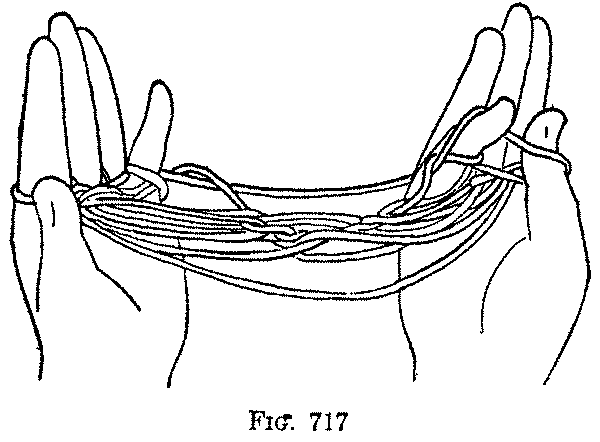 Seventh: Pass each thumb away from you over the thumb, index, middle finger and ring finger loops, and take up from below, on the back of the thumb, the near little finger string and return the thumb to its position (Fig. 713). With the teeth draw the lower thumb loop, of each hand in turn, up over the upper thumb loop (the loop you have just taken on the thumb), and slipping it off the thumb drop it on the palmar side (Fig. 714). 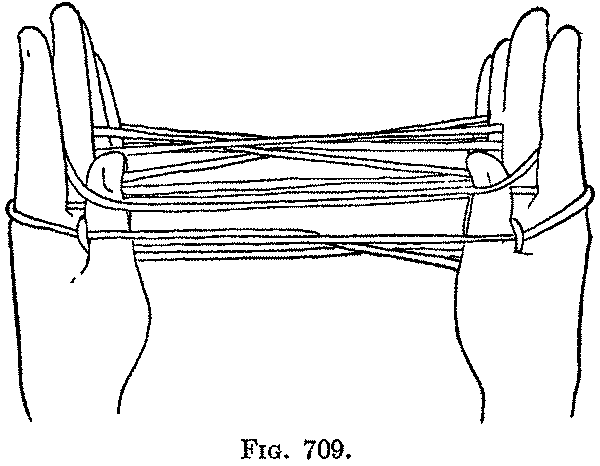 Eighth: Pass each thumb away from you over all the strings except the far little finger string, and pick up on the back of the thumb this far little finger string and return the thumb to its position (Fig. 715). With the teeth draw the lower thumb loop, of each hand in turn, up over the upper thumb loop (the loop you have just taken on the thumb), and slipping it off the thumb drop it on the palmar side (Fig. 716). 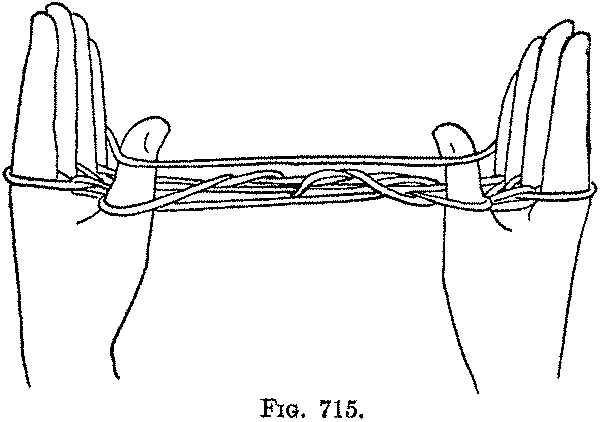 Ninth: Transfer the thumb loops to the little fingers, by bending each little finger toward you and putting it from above down into the thumb loop; and then, picking up on the back of the finger the near thumb string (Fig. 717, Right hand) return the little finger to its position as you withdraw the thumb (Fig. 717, Left hand). 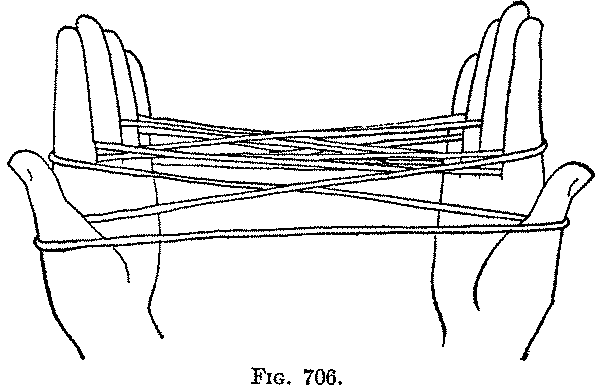 Tenth: Pick up with the teeth the middle of the nearest straight string which runs from hand to hand (it usually hangs down, and is the lower of the two strings which, on each side, form a loop around the near index string). 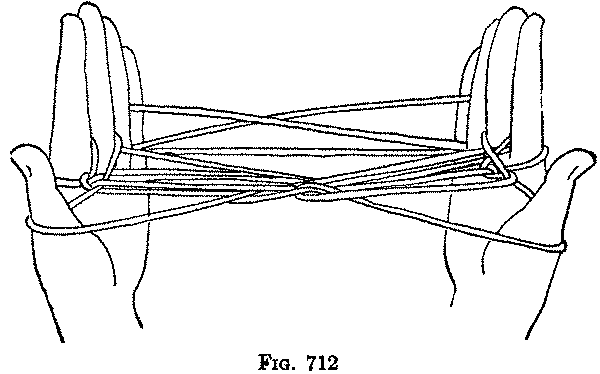 Draw this string toward you, and still keeping the loop between the teeth, extend the figure by drawing the hands away from you, with their palms toward each other and the fingers directed away from you. 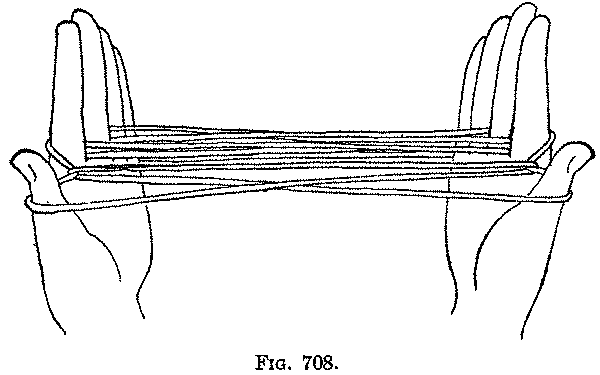 I have found it more convenient, after the figure has been extended, to release the loop held by the teeth and hold it between the tips of the extended thumbs (Fig. 718). In this Eskimo figure, the movement which we have regarded as the most characteristic "Navaho movement" (slipping a lower loop over an upper loop and then off the finger) reaches its maximum development; indeed there is little else in this figure than a constant repetition of this movement. 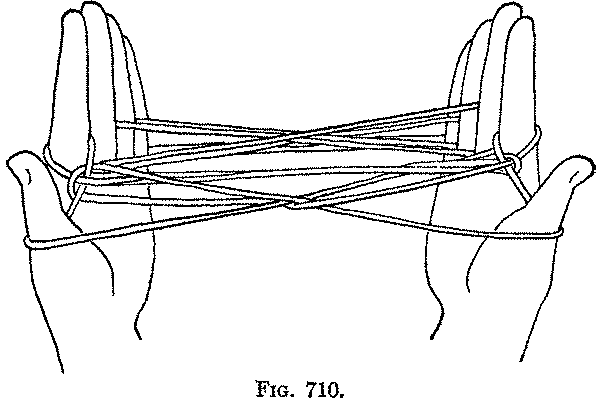 To take the string off the hands without tangling it, release the loop held by the teeth, remove the upper loop from each little finger, and draw the hands forcibly apart. The simple loop can then be dropped from the fingers.